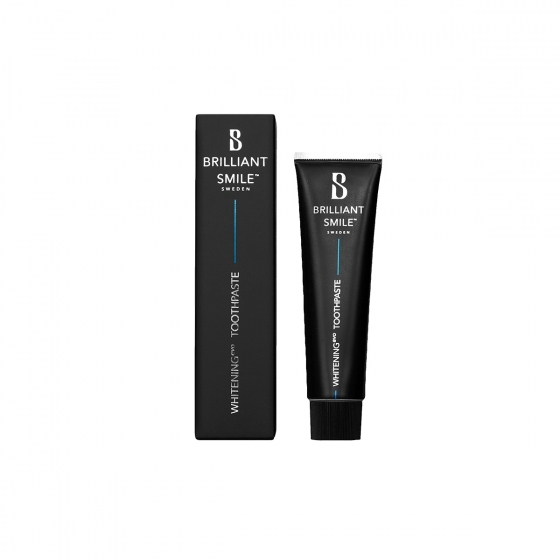 Brilliant Smiles original toothpaste for a whiter, healthier smile. Whiteningevo Toothpaste is an exclusive toothpaste that makes your teeth whiter without damaging abrasives. Daily usage of Whiteningevo Toothpaste prevents surface stains from sticking to the teeth. At the same time it protects your teeth from caries, plaques and sensitivity. Whiteningevo Toothpaste contains active ingredients that dissolve discoloration and cleans your teeth without damaging the enamel. Use twice a day in combination with Brilliant Smiles Whiteningevo Mouthrinse. Children under 7 years old should not use the toothpaste. Pregnant and breastfeeding can use the toothpaste. Hydroxyapatite rebuilds and repairs the enamel, improves strength and hardness, and reduces pain and soreness. Tetrapotassium Pyrophosphate counteracts the formation of plaques and dissolves superficial discoloration / coatings. Zinc citrate counteracts bad breath and effectively prevents the emergence of new discoloration. Potassium nitrate counteracts sensitivity and oxygenation. Poloxamer protects against new discoloration. Fluorescence prevents the appearance of caries.